It’s a dangerous path that so many aging rock stars are forced to walk. Without the bands that made them famous, do they assemble the best imitation of their hits money can buy? Do they force new, unimaginative music on paid audiences in order to maintain some semblance of relevance? Will those audience have any patience beyond what came out of their car stereos in 1979? 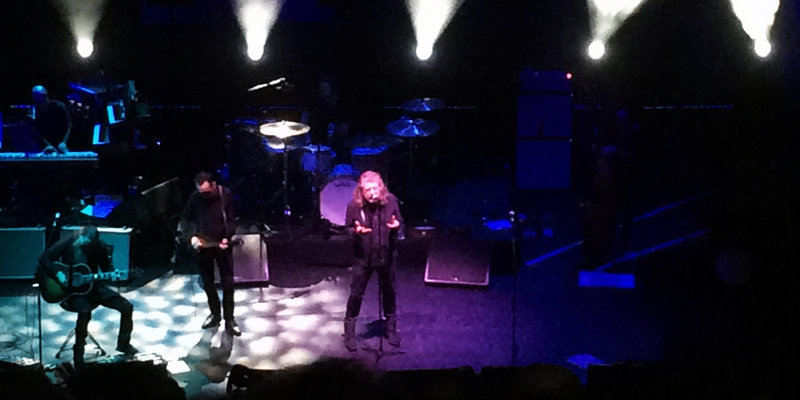 In the midst of this, Robert Plant worries none. After traveling through the wilderness in the aftermath of Led Zeppelin’s sudden breakup in 1980, he’s emerged in the past two decades as a world-ready troubadour. He blends his musical journey with the best of what he encounters, and he doesn’t seem to rest. And on this night at the Orpheum, he wasn’t about to pay heed to anything resembling outside expectations. He was here to play his music as it exists now, and he did it with a wink and a smile. His band, the Sensational Space Shifters, are a six-man unit that can move with his every whim, from electronic beats to spare acoustic throw-downs. And their versatility is essential for the vision that Plant has for each evening. Beginning with songs from his past two albums, that blend of the new and the old, traditional and visionary was apparent, from the opener “New World...,” a song about not becoming bogged down in the past and embracing new challenges, to “Turn it Up,” an ode to driving through America’s highways and catching sounds from disparate radio stations cropping up and fading away with the miles. They work together as mission statements on Plant’s approach, which has become even more far-flung and ambitions as those miles rack up. And there’s hardly time to catch a breath as he moves from station to station. There were more songs from 2017’s Carry Fire, including the title track and “The May Queen,” and retellings of songs from his recent past. “Please Read the Letter,” first recorded with Jimmy on Walking into Clarksdale in 1998 and revisited with Alison Kraus on 2007’s Raising Sand gets maybe its definitive version on this tour, hitting just the right blend of the wonderful bombast of Page and the quiet force of Kraus. It’s folk and it’s rock, programmed and spontaneous. Forever interesting is how he recasts his Led Zeppelin past. “Gallows Pole” from Led Zeppelin III is played at a much faster clip that is likely an ode to its original folk tempo, and Plant took the audience on a tour from Nashville to Memphis and back down the Mississippi River to meet Leadbelly. Likewise, “Misty Mountain Hop” turns into an upbeat Celtic jig, trading the heavy guitar riff for a fiddle refrain that spins it into an almost entirely new song. But the night’s most majestic moment came during “Babe, I’m Gonna Leave You.” The song’s middle section hung closely to Led Zeppelin’s arrangement circa 1969, but it was bookended by classical guitar runs by Skin Tyson that again highlighted its folk origins. It maintained those big, booming calls when the drums kick in and the volume escalates, but it also served to the benefit of Plant’s vocal range in 2018. His voice is arguably stronger now that it was 10 or even 20 years ago, but it’s the way he deploys his vocals within the show and on each song that’s so impressive. It’s all impressive, and progressive. Plant the artist is as curious and restless now at the age of 69 as at any point in his career. He’s blending rhythms from across the globe and folding them within a context of both traditional music and his own groundbreaking catalog that, surely, must feel like a shadow at best and an albatross at worst. In lesser hands, the temptation to trot out the predictable in the name of making a living would be too great to overcome. But when the lights come up and the night is over, that is never the result. He’s become a singular force, a creative and playful master of his realm. And in that way, he’s just as powerful and impressive as he’s ever been.